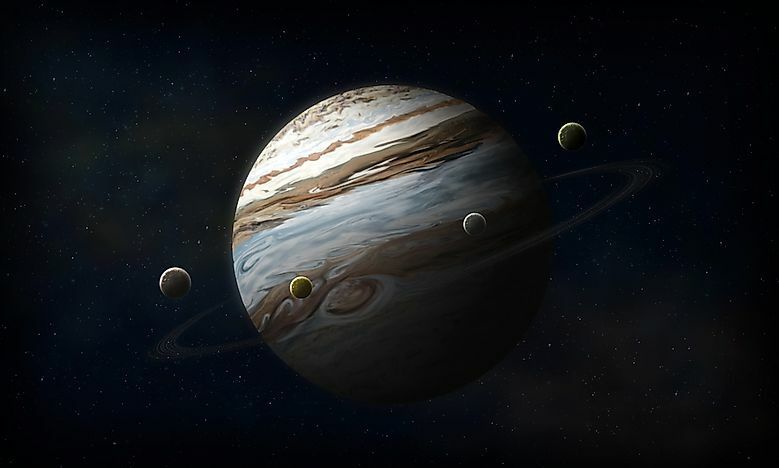 A 3D rendering of the four largest moons of Jupiter, called the Galilean moons. Jupiter has 79 moons in total, many of which are relatively small. Photo credit: Shutterstock.com. 1. Jupiter’s moon count is now at 79, more than any other planet in our solar system. Over the years, the moons around Jupiter have been discovered gradually - starting with Galileo’s discovery of the planet’s most famous moons, like Io and Europa, way back in 1610. As technology progresses, our ability to discover what is lurking in Jupiter’s shadows keeps improving, and moons keep being discovered! 2. The new moons are all quite small. The largest of them, in fact, measures around 1.86 miles in diameter. While that may not seem so small on paper, it is certainly small when the size of Jupiter, the solar system’s largest planet, is considered. Just a reminder - the famous Gaseous giant is so big that 1,300 Earths could fit inside of it! Call this moon discovery an inadvertent victory, or a wonderful coincidence, but scientists weren’t actually looking for any more moons near Jupiter when they found them. Astronomers were instead hoping to find what they call Planet Nine, a planet that is suspected to exist on the outer edge of our solar system. The Dark Energy Camera, or DECam, uses highly-developed sensitive technology to survey areas in the distant solar system. The largest DECam lens measures an impressive 3.3 feet across and weighs 388 pounds, which uses the largest lenses in astronomy. It lives in the Ande mountain ranges north of the Chilean Capital of Santiago. Generally, the many moons around Jupiter orbit it in a direction that is either prograde (in the same direction as Jupiter) or retrograde (in the opposite direction). One of the new moons, named Valetudo, is striking scientists as odd because, while it is prograde, its inclination causes it to sometimes cross the paths of moons that are in retrograde. This anomaly has led scientists to liken the moon to a “car driving the wrong direction on the highway”.